FEBRUARY 22--The man who repeatedly yelled “Allah is great” as he was removed yesterday from a plane that was forced to make an emergency landing due to his unruly behavior is a 19-year-old Saudi Arabian who was arrested Sunday night after he led Oregon police on a drunken car chase that saw him ram two cop cars and attempt to run over pedestrians, The Smoking Gun has learned. According to investigators, Yazeed Mohammed Abunayyan was smoking an electronic cigarette on a Continental Airlines flight traveling from Portland to Houston. 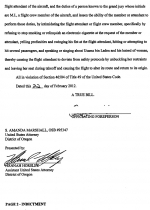 When a flight attendant directed Abunayyan to stop smoking (or relinquish the device), he refused and began “yelling profanities and swinging his fist at the flight attendant,” according to an indictment filed this afternoon in U.S. District Court in Portland. Abunayyan, pictured in the mug shot at right, also hit or attempted to hit other passengers and was “speaking or singing about Usama bin Laden and his hatred of women,” the indictment charges. Abunayyan, who reportedly has been in the U.S. visiting relatives, was charged with a felony count of interfering with flight crew members. 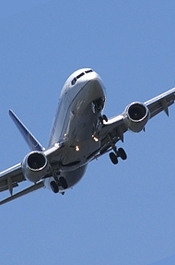 Male passengers on the Boeing 737 helped a flight attendant subdue Abunayyan, who was removed from the plane in plastic handcuffs and turned over to FBI agents. The Continental flight returned to Portland 20 minutes after departure. Abunayyan, who is scheduled to appear later this afternoon before a federal magistrate, was arrested Sunday evening by cops after a wild car chase in Medford, an Oregon city 275 miles south of Portland. Police reported that the intoxicated teenager led them on a 20-minute chase that ended after his Ford sedan got stuck on a dirt embankment. During the chase, Abunayyan was spotted driving in circles, attempting to run over pedestrians, and driving the wrong way on a street. He also rammed two patrol cars. "It was like ‘Grand Theft Auto',” a witness told a local newspaper. Abunayyan was booked late Sunday into the Jackson County jail on a variety of charges, including driving under the influence of intoxicants, assault on a police officer, criminal mischief, hit and run, and reckless endangerment.